As we have seen so many times throughout Roger Federer's illustrious career, he follows up a tough, nail-biting win with an absolute masterclass. 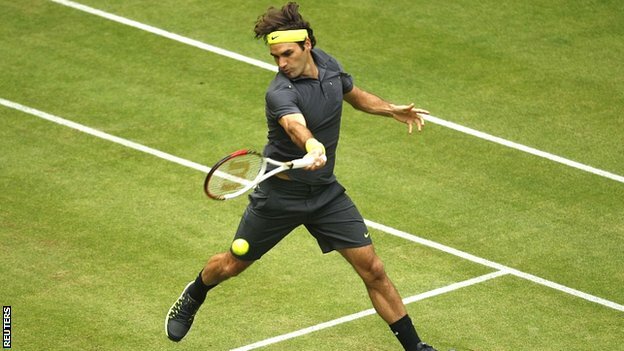 This was the case in the Halle semifinals, where, after coming off a tight win against Milos Raonic (for the third time this year), Federer was in peak form in beating Mikhail Youzhny 61 64 in one hour. Roger was never in trouble from start to finish, and broke Youzhny twice in the opening set to take it in 21 minutes. It was the same in the second set as he went up a double break lead at 5-2. To his credit, Youzhny got one of the breaks back and fought valiantly, saving a few match points on his own serve before forcing Roger to close it out on his own serve, which he did without any difficulty. Is there a more beautiful sight than Federer in motion? If there was any negative energy after the French Open semifinal loss, then reaching the Halle final and being back on grass will certainly help get him back into a better state of mind in his preparation for Wimbledon. I say "if" there was any negative energy because I really think Roger was content (or more content than usual) about losing that match, knowing the challenge that would arise from winning it. Tommy Haas upset Philipp Kohlschreiber 76(5) 75. What Tommy has done since the French Open began has been quite remarkable. He has now won 12 of his past 14 matches (8-5 before that in 2012), including five straight at the French Open when he had to come through qualifying and made it to the 3rd round. He has wins over Tsonga Baghdatis, Berdych, and now Kohlschreiber. For a guy that has struggled with health throughout his career, to be 34 years old and doing this well, even in a short stretch, is remarkable. As great as Haas has been playing, and he has beaten some very good players en route to this Halle final, he now has to come up against Roger, who has to be the overwhelming favourite. However, the match should be close because Haas is a tremendous grass court player. Federer has won their past two meetings in Halle, both in the semifinals, in 2005, which was 64 76(9), and 2006, which was 64 67(4) 63. Look at that floating hair! It should be a great final featuring two men that are a combined 64 years in age! (And 30 year-old David Nalbandian is in the Queens final. Hooray for the old guys!) It has been really refreshing to see such fine grass court tennis this week after the long clay season. The grass at Halle is very special and vintage because it is extremely fast and low bouncing, something of which Wimbledon is not anymore. I guess the older guys have an advantage on a quick short-point and serve-dominated court because all these young players have grown up on slower surfaces, and especially grass lately, with Wimbledon becoming slower than ever. PS: A note of praise for one-handed backhanders: in the four quarterfinal matches, four one-handers played four two-handers, and all the one-handers won. Oh yeah! Being impartial to one-handed backhand players since I use one myself, it is pretty neat to see, since there are far less one-handers than there ever used to be.